Why would I need self storage in San Ramon, CA? There are a variety of reasons why you might need self-storage in San Ramon, CA. How much is a storage unit in San Ramon, CA? The cheapest storage unit in San Ramon, CA is $64.00 per month. What size storage units do you have available in San Ramon, CA? In San Ramon, CA we have sizes that range from 5'x5' to 10'x30' to suit your storage needs. How much is it for a 5'x5' storage unit in San Ramon, CA? The cheapest 5'x5' storage unit in San Ramon, CA is $69.00 per month. San Ramon is a vibrant city in California's Contra Costa County. Conveniently situated within the San Francisco Bay Area, it lies 8 miles northeast of Castro Valley and 16 miles east of Oakland. In addition to convenient shopping, dining and entertainment, you'll find plenty of outdoor fun to be had at facilities like Memorial Park, the Iron Horse Regional Trail, Crow Canyon Gardens and San Ramon Royal Vista Golf Course. The city was named after a Native American livestock herder named Ramon, with "San" later added to the front of the city's name to follow the Spanish custom established by neighboring cities. The land that's now the home of the city of San Ramon was originally inhabited by the Seunen Indians. In the late 1700s, the land was acquired by the nearby Mission San Jose and used as grazing land for its livestock. The area was part of an 1834 land grant to Jose Maria Amador and existed as a large ranch for several years. American settlers arrived in the area in 1850 and began to develop the area. Numerous local streets, hills and canyons in modern-day San Ramon are named after many of these first American residents. San Ramon grew rapidly after a stagecoach line was built through the city. In 1891, the Southern Pacific Railroad reached the city, which helped improve the local economy by providing a way for farmers to transport their crops. San Ramon was officially incorporated in 1983. 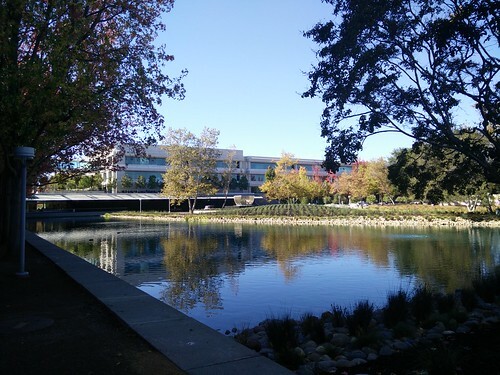 San Ramon is home to the headquarters of several leading businesses, including AT&T, 24-Hour Fitness and Chevron Corp. Many prominent companies also have offices in the city's Bishop Ranch business park including United Parcel Service and Toyota. The strength of these large businesses and others in San Ramon has pushed the local unemployment rate far lower than both the state and national averages, which is good news if you're going to be job hunting in the area. In addition to a variety of job options, you'll find plenty of choices for enjoying your free time. San Ramon is home to a large number of public parks and preserves, many of which are dotted throughout residential areas for easy access. Memorial Park is a large, 16-acre park that offers a children's play area, a BMX course, sport courts, a dog park and picnic areas. Forest Home Farms is a local historic point of interest, constructed in 1900 and given to the city by its owner, Ruth Boone. The site is dedicated to Boone and the significant contributions of women in the San Ramon agricultural industry. You can take guided tours of the space and get to know your neighbors at the weekly farmers market held on-site. The San Ramon Valley Unified School District serves the public schools of San Ramon. Many of its schools have received national recognition for academic performance and student achievement. The district also offers an independent study school if you're planning to homeschool your children. You'll find three convenient options for higher education in San Ramon: Diablo Valley College's San Ramon branch, the University of San Francisco regional campus and the UC Davis Graduate School of Management, designed for working professionals. Utilities: The Dublin San Ramon Services District manages residential and water services. Pacific Gas and Electric is the city's central energy provider. Garbage and Recycling: You can expect curbside collection of your trash, recyclables and organic waste. Transportation: As a popular home base for commuters, San Ramon offers a variety of transportation options. The San Ramon Transit Center is the local transit hub, providing easy connections through the city and the Greater Bay Area. San Ramon has a wide variety of housing, from the affordable properties in Canyon Lakes, Country View and Portola to the more expensive dwellings of Norris Canyon Estates, Renaissance at Roubion, Old Ranch Estates and Summit and The Gallery & Capella at Gale Ranch. If you're looking for a happy medium, try homes in Bollinger Hills, Canyon Crest or Heritage. San Ramon properties tend to be much more expensive than in the average U.S. city, with a median price that reaches above a million dollars. Our lowest priced units in San Ramon, CA average $66.50 per month. 53 people have reserved units in San Ramon, CA in the past 30 days. There are 2 locations within San Ramon, CA's city limits.